SOCHI, November 23. /TASS/. Specific attention in Russia’s new state program of armaments will be focused on precision weaponry, Russian Deputy Defense Minister Yuri Borisov said on Thursday. "Specific attention will be focused on precision weaponry, as it is a present-day tendency in the development of all armed conflicts. If we speak about precision weapons, they are data intelligence systems, since precision weapons won’t work without information," he said. Development of nuclear deterrence systems will be a priority of Russia’s new state program of armaments, he said. "Top priority, naturally, will be given to the development of nuclear deterrence systems as a key type of armed forces which guarantees security of our country in conflicts of any kind," he said. "If we speak about aircraft cruisers, it is the end of the program. We plan to develop and manufacture state-of-the-art aircraft carriers," he said. Russia’s new state program of armaments provides for the development of a vertical take-off plane, he said. "Naturally," he said when asked whether works on a vertical take-off plane for aircraft carriers are being conducted. "It is logical to surmise that over this time the existing models, I mean the MiG-29 and the Su-33, will become morally obsolete and a new aircraft will be needed in a span of ten years. We do have such plans," he said. A draft of Russia’s new state program of armaments will be submitted to the presidential administration by December 15. "Today, it [the program] is at the final stage of elaboration. It is already being considered by the government. I think it will be submitted to the administration by December 15. I cannot give an exact date when the president approves it. But at least, it will be at the presidential administration by December 15," he said. The new arms program will envisage allocation of 19 trillion rubles (325.43 billion US dollars) to finance weapons supplies and one trillion rubles (17.12 billion US dollars) to finance synchronization, said Deputy Defense Minister Tatiana Shevtsova when asked by TASS to comment on reports that Defense Minister Sergei Shoigu had asked a sum of 33 trillion rubles (565.22 billion US dollars). "Naturally, we don’t think that financing is insufficient," she said. "The state program is well-balanced and well-planned. What matters most is that the current program envisages 19 trillion on supplies of weapons and military hardware and one more trillion - on the system of synchronization," she said, adding that it is a key difference from the previous such program which did not include spending on synchronization. " Earlier in the week, Russian President Vladimir Putin said opening the tenth series of meetings with the Russian top brass and defense industry executives that Russia’s new state armaments program is called to ensure efficient neutralization of external threats. "Now, we are finishing to draft a new state program of arms procurements. Combat capabilities of the army will depend on its implementation in the coming decade and in a long-term perspective. Hence, it is necessary to analyze thoroughly all our plans," he said. He stressed that the Russian army and the fleet must be armed with the most state-of-the-art weapons "that take into account possible changes in the strategy and tactics of warfare of the future." 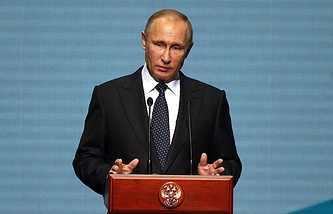 "If we want to lead the way, if we want to win, we must be the best," Putin stressed. "The program’s key provisions are called, first of all, to ensure guaranteed strategic deterrence, and in the event of an external threat - its efficient neutralization." He called to pay special attention in the new program to coordination of weapons supplies with the construction of military infrastructure.